Post by A World at School. Day of the African Child is on June 16 - when events will be held on the continent and around the world. Here are 16 things you should know about this day and why children's rights in Africa are so vital. 1. The June 16 annual event honours the memories of students who were massacred in Soweto, South Africa, in 1976 for protesting against education injustice and inequality in the apartheid regime. 2. It was designated as Day of the African Child in 1991 by the African Union and every year events are organised to promote children's rights. 3. This year's theme is "Right to participate: let children be seen and heard". 4. Thirty million of the world's 57million children out of school are in sub-Saharan Africa. 5. The biggest event this year is a youth takeover of the Africa Union in Addis Ababa, Ethiopia, by 500 young people from countries all over the continent. 6. On June 16, there will be 560 days left until the Millennium Development Goals deadline of the last day of 2015 - MDG2 was to ensure that all children in the world are in school and learning. 7. The Day of the African Child theme last year was "eliminating harmful social and cultural practices affecting children: our collective responsibility". 8. One in six children born in sub-Saharan African do not live to their fifth birthday - even though child mortality fell by 45% between 1990 and 2012. 9. More than 100 events in more than 40 countries are being held around the world to mark Day of the African Child and Youth Action Month. 10. A campaign to end child marriage across Africa was launched in May by the African Union. One in three girls in low and middle-income countries are married by the age of 18. 11. One of the aims of the Day of the African Child is to highlight harmful practices such as genital mutilation. Thirty million girls in Africa are in danger of undergoing FGM in the next decade. 12. The poorest children in sub-Saharan Africa are four and a half times more likely to be out of school than the richest children. 13. By the year 2050 almost one in three of the world's children under 18 will be African. 14. The children of African women with at least five years of schooling have a 40 percent higher chance of survival. 15. UNICEF and partners have secured the release of more than 1000 children from armed groups in the Central African Republic this year, more than five times the total number of children released in 2013. 16. There are wide variations in school enrolment between African countries - ranging from 37% for boys and 34% for girls in Eritrea to 98% for both boys and girls in Tanzania. The Batwa are an ethnic minority group in Kabale district. They have for a long time been unconsciously involved in practices of human rights abuse. The women especially have suffered violence at the hands of their husbands and society because of the deeply entrenched attitudes and stereotypes that demean women; low levels of formal education and ignorance; alcohol and drug abuse; resource poverty; poor housing and unemployment. Women among others have suffered double marginalization the most; first as women and second as batwa. African International Christian Ministry (AICM) used Community change agents to reach out to this community to address these human/women rights violations. 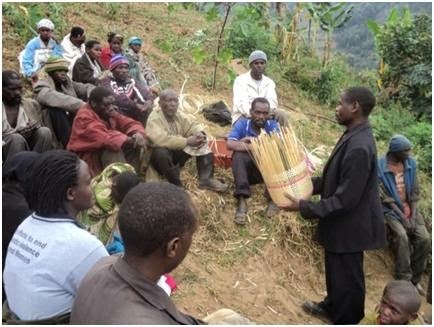 Community Change agents are largely batwa and non batwa resource persons identified and trained in human rights, advocacy, documentation and referral issues. They sensitize/educate the community on human rights issues, and counsel the batwa about the danger of alcoholism which is seemingly an acceptable life style amongst their community. They also report and handle cases of violence, and follow up these cases to ensure that justice is extended to the victims of Sexual Gender Based Violence. AICM is an IDF supported grantee whose interventions are aimed at contributing to the realization of women’s rights among Batwa resident communities in the sub counties of Butanda, Bufundi, Muko, and Ikumba. Community change agents have been instrumental in empowering their fellow batwa, transforming the community and contributing to AICM’s overall project goal; for instance, the works of Mrs. Ntarugondimu Peace and Ntamusore Pafura testify to this. participated in the submission of a petition on the batwa rights to the Equal Opportunities Commission in Kampala on February 5th 2013. She is grateful to AICM and IDF for the change this project has caused in her community; “before this project started, we were ignorant about our rights, taken advantage of and also raped on several occasions with no help, and were girls were not in school, but now the situation is changing; we know where to report and get justice for the violations committed against us, our girls are in school, and we have also started engaging in meaningful development activities” Peace remarks. Pafura noted during a sensitization meeting with the men of Butanda and Bufundi Sub counties. Just like Peace, Pafura has also been on radio to expound on the how the Batwa and their Bakiga neighbors can work together to end sexual and gender based violence in the community. Pafura appeals to the Batwa men to display good behavior, and be exemplary to their children by living domestic violence free lives. Pafura is a role model in his community. He has worked hard, progressed and proven that batwa too can develop like any other human being and live a violence free life. Pafura is one of the two Batwa in Kabale district that have bought land and also built a permanent house without external support. The work and achievements of the change agents, has won admiration of both Batwa and non Batwa and served as an inspiration to them to be better people. And this has allowed for transformation in amongst the batwa. Recreation for development &Peace (RDP-Uganda) used the Youth Budget Advocacy Group (YBAG) model to implement their project “Enhancing youth rights to participate in development in Oyam District”. The YBAG is a nine member group that sits quarterly to review and discuss key youth related issues. Action plans are developed for the YBAG to engage duty bearers to get their commitment to address raised challenges through dialogues, one on one engagement, and meetings. Follow up meetings; phone calls and actual monitoring are used to track the commitments made. The YBAG also continuously mobilizes young people to engage in the development process. The purpose of the project was to address youth challenges such as limited participation in development projects and engagement with local leaders/duty bearers. 1. Establishment of four YBAGs to secure solutions to the raised youth concerns. 2. Conducted 40 follow up meetings on a quarterly basis at both Sub County and District levels and development of action/follow plans for both sub county and district stakeholders. 3. 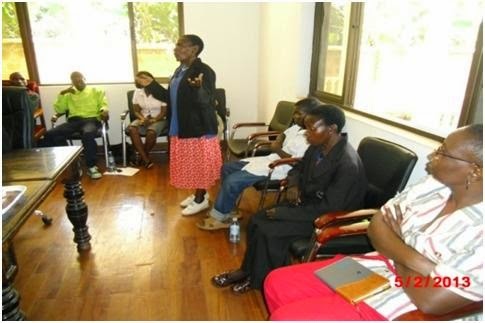 Trained YBAG members in lobbying and advocacy, human rights based approach in planning and access to information. 4. Engaged YBAGs in various campaigns like the youth advocacy week and the right to know day commemoration campaigns. 5. Conducted monthly coordination meetings to review plans and update members on the progress of the youth project. 6. Conducted youth parliaments at radio shine where the YBAG members tasked duty bearers to respond to raised youth concerns. Increased assertiveness of the youths in demanding for their entitlements; for instance the youths demanded the district for a refund of the misappropriated 1.8 million youth fund. This had allegedly been paid to Uganda Revenue Authority as PAYEE. Through the various follow up meetings and petitions written to the Chief Administrative Officer and the District Speaker, 1.8 million shillings was released to the youth and used to facilitate entrepreneurship training for the youths. “We are very grateful for this, nobody expected these local funds to come back, I now believe that with such innovations of the YBAG anything is possible” asserted a youth in Oyam district. Conducting of the first district youth council meeting since 2011. This was made possible by the increase in the budget allocations. Increased number of youth beneficiaries in government programs. 15-20 % of the NAADs beneficiaries in the F/Y 2012/2013 were youths- District NAADS Report 2013. While a youth group in Amakigungu Parish also got 3.6 million shillings from the Community Demand Driven (CDD) initiative and started a piggery project. Increased youth involvement in government programs; for instance more youths have been included on the procurement committees at sub county level. Use of existing groups and structures like the youth groups, Community Development Office, Youth Committees and Youth Councillors ensures sustainability of the project. It is possible that new groups/structures formed at the inception of the project would not have effectively taken on the cause/action like the already existing groups did.